A greenhouse is an asset to any garden and essential to many for the propagation of seeds and plants and for providing suitable growing conditions for a wide range of plants that would be unable to survive in the external environment. In order to obtain maximum benefit from a greenhouse it is necessary to understand certain factors when embarking on the construction, equipping of and working within a greenhouse. It is important that as much light as possible enters the greenhouse, therefore consideration as to the position of the structure is required. Tall trees, boundary fences and walls can create shadows, obstructing light, so thought is required as to how much sunlight is available all year round, not just the summer months. 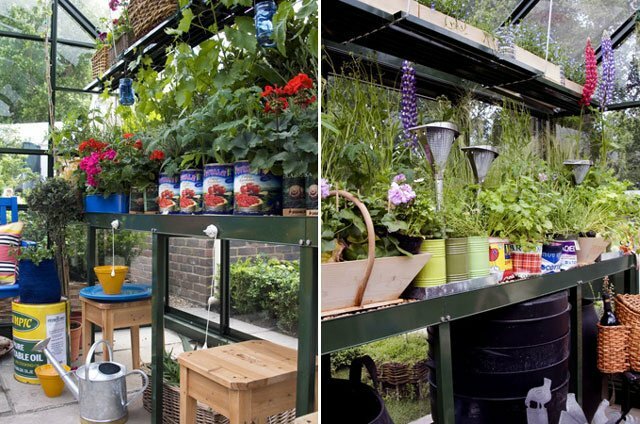 A greenhouse facing south is ideal if it is a lean-to structure against a wall. However, free-standing, independent structures should be placed east – west in order to avoid the lattice blind effect on conventional apex structures and gain maximum sunlight during the winter and spring. The choice of materials is normally limited to either wood or aluminium, although less expensive structures based on alloys and plastic are available for the amateur market. Wood is a traditional material and can appear more attractive in some gardens. However it requires periodic upkeep and more general maintenance. 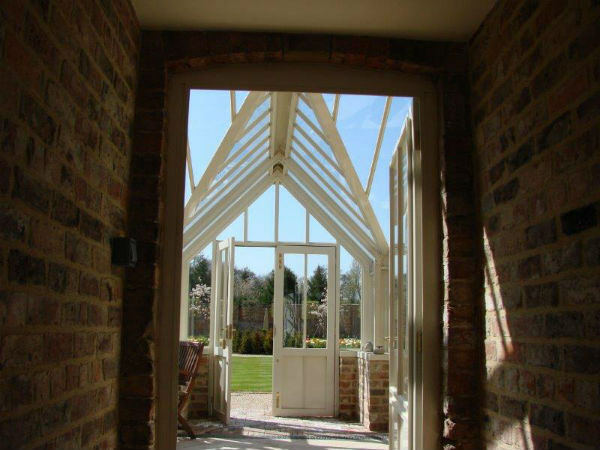 The advantages of aluminium are that they need virtually no maintenance, and the structural frames are thin, casting very little shade. Aluminium, normally powder coated in a colour of your choice may blend beautifully into the garden, especially if the structure can be seen from the home. 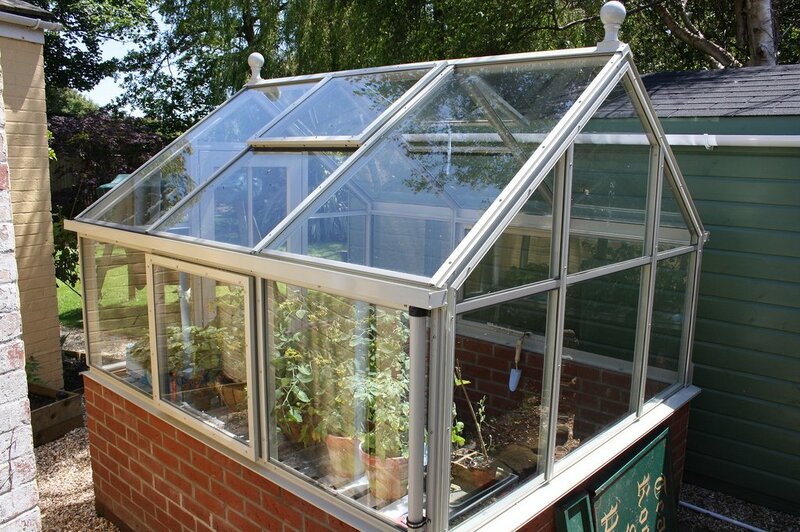 To make the most of a greenhouse it is advantageous to use additional heat. For smaller greenhouses it is best to invest in an electrical fan heater with a thermometer switch to achieve the desired temperature. Many commercial structures often use blown heat, but for large domestic structures a hot water pipe system with a boiler powered by either gas or oil is the norm. Thermostats for the system should be located at plant height near the centre of the greenhouse where they are not influenced by drafts or sidewall cooling and protected from direct contact with sunlight and water. These devices are energy saving and even simple models can provide different daily temperature settings that automatically lower the night temperature and raise it in the morning. Often the suns rays can cause the greenhouse to become overheated between spring and autumn, which can lead to the plants becoming stressed. It is well known that hot air rises, so this is the easiest route for any hot air to exit, via the roof ventilation. The process is improved with the use of vents that open in the sides of greenhouse. Automatic ventilation will assist in providing stable temperatures. A simple calculation of 25% of the floor area will ascertain the minimum amount of opening vent space that is required. Remember, if you feel uncomfortable in your greenhouse, and then so do your plants. Many plants can be grown against the back wall of a greenhouse. Fruit is a popular choice producing a large crop in a small space, using traditional fruit training techniques. Ornamental plants can also be grown in this space e.g. Pelargonium, and any number of climbing plants from warmer climes such as Bougainvillea. Some form of benching or staging is essential for providing an area to support growing plants and potting on. The staging needs to be strong and capable of supporting the heavy weight of pots laden with plants and moisture. Freestanding benching is the most popular and can be constructed of slatted wood (cedar) or aluminium. Aluminium has the advantage of longevity and requires no maintenance. They should not be too wide and stand about the same height as a kitchen worktop (90cm). Ensure that they are level and that there is enough room for access and to undertake work on them. 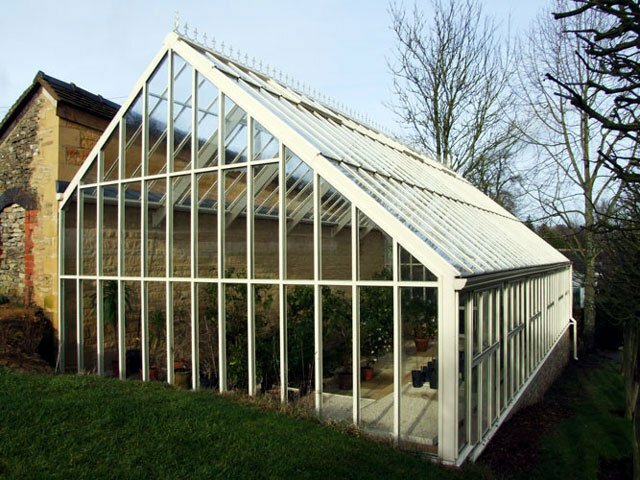 Many garden greenhouse manufacturers produce staging and shelf equipment specially made for particular greenhouses, but there are independent manufacturers that supply ranges to fit all greenhouses. Capillary benches are widely available and allow crops of similar plants and pot sizes to be kept evenly watered right the way through the day. This is constructed using a normal flat bench with 5cm-raised edges. The surface is lined with capillary matting, which goes over the side of the bench into a vat of water. The capillary matting will draw up water and remain damp so that pots placed on the surface of the capillary matting will maintain a steady moisture level throughout the day. Additionally liquid fertiliser can be added to the water vat thereby automatically feeding and watering the plants. Lower benches are handy for those plants that are resting, such as corms e.g. Cyclamen and tubers e.g. Achimenes (Hot water plants). Remember to check on them from time to time. Also they are convenient for storing items such as the watering can, sticks for plant supports and spare pots. A top shelf is ideal for orchids as this can mimic their natural environment well, as they grow in trees. It is best to make sure that the pots are well balanced so that they will not fall off when they are watered. Small individual plastic propagators are ideal for limited space. These are supplied with propagating trays with soil warming cables in their base which are connected to the standard electricity supply with a built-in thermostat to enable the temperature to be varied at will and kept constant. These are very useful when raising plants either from seed or cuttings. Using the bottom heat means many seeds can germinate very quickly. It is also possible to build your own propagator that will fit the exact space available to you. Construct a wooden frame with 10cm sides and place a piece of 25mm polystyrene covered polythene in the base, lay the soil warming cables on it and cover with approx 40mm of coarse sand. The cables will need to be connected to a thermostat and an electric supply as recommended by the manufacturer. The pots or trays are then simply placed on the sand, which will warm them. To further improve on this arrangement for propagating cuttings it is recommended that a fine mist spray connected to a sensor be installed. This will stop the cuttings become dehydrated and increase the success rate and speed of rooting for cuttings. The need to control the sunlight coming in through the glass is best achieved by the use of shading. Pull-down blinds with strips of reflective aluminium are popular and easy to use as an alternative to the traditional wooden slatted blinds. Alternatively, for a small greenhouse you can use a ‘paint on’ shading liquid that will last the season or shade netting that is fitted over the structure during the high season. Once you have grown your plants on they need a to be hardened off before going out into the garden. That means not giving them a shock by going from the hot into the cold, so using a cold frame is ideal. This can be an independent structure or one bought as part of a package from a greenhouse manufacturer. For larger greenhouse there is now the opportunity to utilise a computer to control the heating and ventilation. This will have been initially been programmed so that each relevant sensor has been named, sited and numbered. The various limits that are required will have been entered to allow the system to work. It is likely that there will be different requirements as regards the use of the heating and ventilation controls during the course of the year. Alteration of the set points on the computer programme will allow the glasshouse environment to be adjusted to suit the crop being grown at any given time. It is possible to make adjustments and cross-reference the changes so that there are no conflicting settings within the programme. For general purposes the control programme will use Day/Night settings. It is recommended that a printout be taken of alterations throughout the year as a record and also as a guide for future requirements. 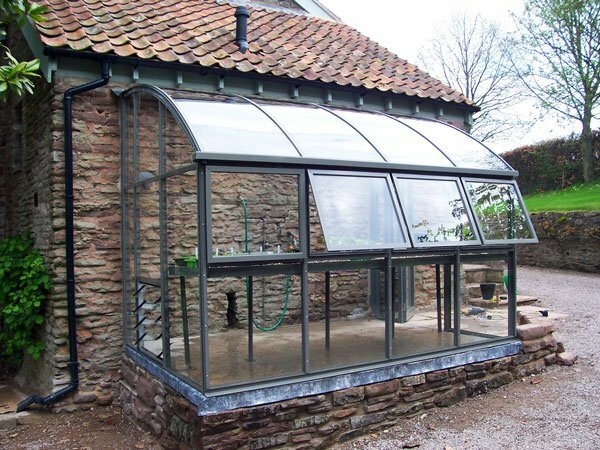 A three quarter span Hartley Lean-to glasshouse build against a stone wall. Cleaning the greenhouse on a regular basis is an essential maintenance practice. By promoting good hygiene practices the risk of over wintering pests and disease will be reduced. Various products are available for this task and should be used at the recommended rate. Article Extractions first published in The Professional Gardener.